Our Sunday Poem today is "A Leaf, a Hare" by Rebecca Dunham, reflecting on the state of Odysseus' marriage to Penelope upon his return from his epic journey. It comes from the Verse Daily website, reprinted from Dunham's collection The Miniature Room. Dunham received her PhD in creative writing from the University of Missouri-Columbia, and is now Assistant Professor of English at the University of Northern Iowa. Her awards include the Jay C. and Ruth Halls Poetry Fellowship, the 2005 Indiana Review Poetry Prize, and a 2005 Academy of American Poets Prize. 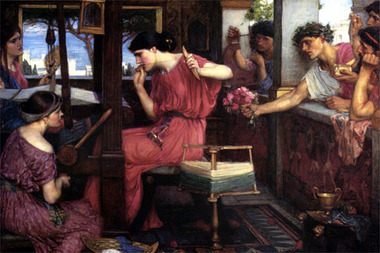 The picture at the top of this post is "Penelope and the Suitors" by JW Waterhouse. Luis Urrea recently spent two solid weeks reading and recording the entire text of his amazing novel The Hummingbird's Daughter, which is now available as a free download through Audible.com. You can download it to your ipod, your computer, or burn it onto a CD. As an added bonus, it features "Teresita's Suite," an original series of acoustic guitar pieces performed by Shawn Phillips. 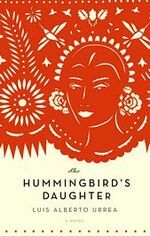 The Hummingbird's Daughter is a glorious novel, twenty years in the making as Urrea researched the history of Teresita Urrea (the illegitimate mezito daughter of the wealthy Don Tomas), who became, at the flash point of the Mexican Revolution, an amazing mystic, healer, and saint to the Indians. She was a young woman that Diaz dubbed "The Most Dangerous Girl in Mexico." Urrea's writing is gorgeous -- rich and evocative -- whether describing the earthy, mystical world of the curandera (traditional healers), the complex political upheavals of Mexico, or the tenderness of a reprobate father discovering in his half-wild daughter an improbable partner.